Muscleblaze.com ('Website') is an online service owned, operated and managed by Bright Lifecare Private Limited ('Muscleblaze' or 'we' or 'us'). In using/accessing the Muscleblaze website, you are deemed to have accepted the terms and conditions of the agreement listed below or as may be revised from time to time ('User Agreement'), which is, for an indefinite period and you understand and agree that you are bound by such terms till the time you access this Website. If you have any queries about the terms and conditions of this User Agreement or have any comments or complaints on or about the Website, please email us at [email protected] or call us on +91-9599928558. We reserve the right to change the terms and conditions of this User Agreement from time to time without any obligation to inform you and it is your responsibility to look through them as often as possible. Any use of this Website or its contents, including copying or storing it or them in whole or part, other than for your own personal, non-commercial use is prohibited without the explicit permission of MuscleBlaze. All information displayed, transmitted or carried on the Website is protected by copyright and other intellectual property laws. Copyrights and other intellectual property in respect of the some of the content on the Website may be owned by the third parties. This site is designed, updated and maintained by MuscleBlaze or its licensors. You shall not modify, publish, transmit, transfer, sell, reproduce, create derivative work from, distribute, repost, perform, display or in any way commercially exploit any of the content available on the Website. We have taken all care and precaution to try and provide accurate data and information. In the preparation of the content of this Website, in particular to ensure that prices quoted are correct at time of publishing and all products have been fairly described. All prices are displayed inclusive of VAT. Services however are listed exclusive of service tax as rules for service tax vary with different services. Packaging may vary from that shown. 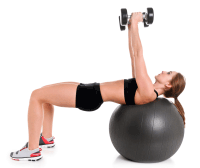 The weights, dimensions and capacities given are approximate only. We have made every effort to display as accurately as possible the colours of our products that appear on the Website. However, as the actual colours you see will depend on your monitor, we cannot guarantee that your monitor's display of any colour will accurately reflect the colour of the product on delivery. All products/services and information displayed on the Website constitute an invitation to offer. Your order for purchase constitutes your offer which shall be subject to the terms and conditions of this User Agreement. We reserve the right to accept or reject your offer in part or in full. Our acceptance of your order will take place upon dispatch of the product(s) ordered. Dispatch of all the product(s) ordered, may or may not happen at the same time, in such a scenario that portion of the order which has been dispatched will be deemed to have been accepted by us and the balance would continue to be on offer to us and we reserve the right to accept or reject such balance order. No act or omission of MuscleBlaze prior to the actual dispatch of the product (s) ordered will constitute acceptance of your offer. If you have supplied us with your email address or phone number, we will notify you by email and/or phone number, as the case may be, as soon as possible to confirm receipt of your order and email/contact you again to confirm dispatch and therefore acceptance of the order. All products sold on MuscleBlaze.com through our sellers are genuine. All sellers listing their products on MuscleBlaze.com are required to enter an agreement to list and sell only genuine products. And sellers determine the prices of the products they sell. We guarantee the condition of the item you buy when you purchase from sellers on MuscleBlaze.com. However this guarantee is not applicable for manufacturing defects. We disclaim all warranties or conditions, whether expressed or implied, (including without limitation implied, warranties or conditions of information and context). We shall not be liable to any person for any loss or damage which may arise from the use of any of the information contained in any of the materials on this Website. This User Agreement and any contractual obligation between us and you will be governed by the laws of India, subject to the exclusive jurisdiction of Courts in New Delhi. All disputes will be subject to arbitration in New Delhi in English by a single arbitrator appointed by us under the Arbitration and Conciliation Act, 1996. Each party to arbitration shall bear its own cost. You agree to defend, indemnify and hold harmless MuscleBlaze, its employees, directors, officers, agents and their successors and assigns from and against any and all claims, liabilities, damages, losses, costs and expenses, including attorney's fees, caused by or arising out of claims based upon your actions or inactions, which may result in any loss or liability to MuscleBlaze or any third party including but not limited to breach of any warranties, representations or undertakings or in relation to the non-fulfillment of any of your obligations under this User Agreement or arising out of your violation of any applicable laws, regulations including but not limited to intellectual property rights, payment of statutory dues and taxes, claim of libel, defamation, violation of rights of privacy or publicity, loss of service by other subscribers and infringement of intellectual property or other rights. This clause shall survive the expiry or termination of this User Agreement. IF YOU DO NOT AGREE, PLEASE DO NOT USE OR ACCESS THE WEBSITE. “We may also send you other information about us, the Site, our other websites, our products, sales promotions, our newsletters, SMS updates, anything relating to other companies in our group or our business partners. If you would prefer not to receive any of this additional information as detailed in this paragraph (or any part of it) please click the “unsubscribe” link in any email that we send to you or register as a Do Not Disturb user. Within 7 working days (days which are neither (i) a Saturday or Sunday, nor (ii) a public holiday anywhere in India) of receipt of your instruction we will cease to send you information as requested. In case of any clarity you can contact our Customer support service”. We and our suppliers and licensors expressly reserve all intellectual property rights in all text, programs, products, processes, technology, content and other materials, which appear on this Website. Access to this Website does not confer and shall not be considered as conferring upon anyone any license under any of our or any third party's intellectual property rights. All rights, including copyright, in this Website are owned by or licensed to us . Any use of this Website or its contents, including copying or storing it or them in whole or part, other than for your own personal, non-commercial use is prohibited without our prior permission. You may not modify, distribute or re-post anything on this Website for any purpose. The MuscleBlaze names and logos and all related product and service names, design marks and slogans are the trademarks or service marks of MuscleBlaze or licensed to MuscleBlaze. All other marks are the property of their respective companies and you shall not use or exploit the same in any manner whatsoever. No trademark or service mark license is granted to you in connection with the materials contained on this Website. Access to this Website does not authorize anyone to use any name, logo or mark which appear on the Website in any manner. References on this Website to any names, marks, products or services of third parties or hypertext links to third party websites or information are provided solely as a convenience to you and do not in any way constitute or imply our endorsement, sponsorship or recommendation of the third party, information, product or service. We are not responsible for the content of any third party websites and does not make any representations regarding the content or accuracy of material on such websites. If you decide to link to any such third party websites, you do so entirely at your own risk. All materials, including images, text, illustrations, designs, icons, photographs, programs, music clips or downloads, video clips and written and other materials that are part of this Website (collectively, the “Contents”) are intended solely for personal, non-commercial use. You may download or copy the Contents and other downloadable materials displayed on the Website for your personal use only. No right, title or interest in any downloaded materials or software is transferred to you as a result of any such downloading or copying. You may not reproduce (except as noted above), publish, transmit, distribute, display, modify, create derivative works from, sell or participate in any sale of or exploit in any way, in whole or in part, any of the Content, the Website or any related software. 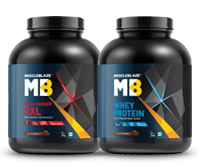 All software used on this Website is the property of MuscleBlaze or its suppliers and licensors and protected by Indian and international copyright laws. The Content and software on this Website may be used only as a shopping resource. Any other use, including the reproduction, modification, distribution, transmission, republication, display, or performance, of the Content on this Website is strictly prohibited. Unless otherwise noted, all Content are copyrights, trademarks, trade dress and/or other intellectual property owned, controlled or licensed by us, our affiliates or by third parties who have licensed their materials to us and are protected by Indian and international copyright laws. The compilation (meaning the collection, arrangement, and assembly) of all Content on this Website is the exclusive property of MuscleBlaze and is also protected by Indian and international copyright laws. We don't offer any Counterfeit goods contain a trademark or logo that is identical to or substantially indistinguishable from the trademark of another. This User Agreement is effective unless and until terminated by either you or us. You may terminate this User Agreement at any time by informing us in writing through Indian postal system by registered post, that you no longer wish to be associated with this Website, provided that you discontinue any further use of this Website. We may terminate this User Agreement at any time and may do so immediately without notice, and accordingly deny you access to the Website. Such termination will be without any liability to MuscleBlaze. Upon any termination of the User Agreement by either you or us, you must promptly destroy all materials downloaded or otherwise obtained from this Website, as well as all copies of such materials, whether made under the User Agreement or otherwise. Our right to any Comments shall survive any termination of this User Agreement. Any such termination of the User Agreement shall not cancel your obligation to pay for the product already ordered from the Website or affect any liability that may have arisen under the User Agreement. The Website is provided without any warranties or guarantees and in an "As Is" condition. You must bear the risks associated with the use of the Website. The Website provides content from other Internet websites or resources and while we try to ensure that material included on the Website is correct, reputable and of high quality, we shall not be held liable or responsible if this is not the case. We will not be responsible for any errors or omissions or for the results obtained from the use of such information or for any technical problems you may experience with the Website. This disclaimer does not apply to any product warranty offered by the manufacturer of the product as specified in the product specifications. This disclaimer constitutes an essential part of this User Agreement. To the fullest extent permitted under applicable law, we or our suppliers shall not be liable for any indirect, incidental, special, consequential or exemplary damages, including but not limited to, damages for loss of profits, goodwill, use, data or other intangible losses arising out of or in connection with the Website, its services or this User Agreement. Without prejudice to the generality of the section above, our total liability to you for all liabilities arising out of this User Agreement be it in tort or contract is limited to the amount charged to you, against the value of the products ordered by you. MuscleBlaze, its associates and technology partners make no representations or warranties about the accuracy, reliability, completeness and/or timeliness of any content, information, software, text, graphics, links or communications provided on or through the use of the Website or that the operation of the Website will be error free and/or uninterrupted. We assumes no liability whatsoever for any monetary or other damage suffered by you on account of the delay, failure, interruption, or corruption of any data or other information transmitted in connection with use of the Website; and/or any interruption or errors in the operation of the Website. Forging any TCP/IP packet header or any part of the header information in any email or newsgroup posting. Violations of system or network security may result in civil or criminal liability. We will investigate occurrences that may involve such violations and may involve, and cooperate with, law enforcement authorities in prosecuting users who are involved in such violations. You agree not to use any device, software or routine to interfere or attempt to interfere with the proper working of this Website or any activity being conducted on this Website. You agree, further, not to use or attempt to use any engine, software, tool, agent or other device or mechanism (including without limitation browsers, spiders, robots, avatars or intelligent agents) to navigate or search this Website other than the search engine and search agents available from MuscleBlaze call us on +91-9599928558 on this Website and other than generally available third party web browsers (e.g., Google Chrome, Firefox, Microsoft Internet Explorer). Health Related Information. The information contained in the Web Site is provided for informational purposes only and is not meant to substitute for the advice provided by your doctor or other health care professional. You should not use the information available on or through the Web Site (including, but not limited to, information that may be provided on the Web Site by healthcare or nutrition professionals employed by or contracting with MuscleBlaze) for diagnosing or treating a health problem or disease, or prescribing any medication. Information and statements regarding dietary supplements have not been evaluated by the Food and Drug Administration and are not intended to diagnose, treat, cure, or prevent any disease. You should read carefully all product packaging prior to use. The results from the products will vary from person to person. No individual result should be seen as typical.